Editor's note: Aaron Brodie is an independent journalist who freelances for CNN and TornadoVideos.net. He covers various stories for CNN and its networks, and he is working with TVNWeather.com to produce episodes of an upcoming online reality series. Hurry up and wait: surely, that must be the official slogan of storm chasers who race from one side of Tornado Alley to the other, only to wait, and wait, and wait, to see the awesome power of nature. That has certainly been the case for the TornadoVideos.net team these past few days. Reed Timmer, whom you may know from the TV show "Storm Chasers," led us from Norman, Oklahoma, to the Texas Panhandle on Sunday, where we spent hours waiting for a storm to boil up into something worth chasing. As it became clear the Panhandle was a bust, some members of the team argued for heading southeast to intercept storms in Oklahoma, while others wanted to drive north into Kansas. While we were blasting north to Kansas, which turned out to be a bust as well, the storms in Oklahoma produced a handful of tornadoes. "This is the day before the day," Timmer and other team members proclaimed, referring to the predictions of a bigger chase on Monday. "We gave it 100 percent and that's all we can do,” Timmer reassured the team. The drive to home base in Norman was filled with a mixture of hope and disappointment. The next morning, we headed for Dallas/Fort Worth, Texas, with a TV news crew following our caravan. The chase team was led by Timmer in the "Dominator," an armored Chevy Tahoe with bulletproof windows. The Dominator can drive into tornadoes and record valuable meteorological data from inside the funnel. The Dominator was followed by a GMC Yukon that’s been coated with Line-X to help protect it against hail. The Yukon provides support for the Dominator, and has a follow camera to show the armored vehicle driving into a twister. We headed south, running on 4 hours' sleep, adrenaline and gas station food. It’s a mystery to those of us in the Yukon why we only eat at gas stations. Perhaps it’s because we make sure to fuel the vehicles at every stop, a requirement that eliminates most fine dining establishments in rural Oklahoma. At a gas station stop, you quickly learn how to pick items from the four basic food groups: beef jerky, chips, sweets and caffeine. If you’re lucky, you’ll also find a cylindrical food item spinning around on a heated set of rollers. It’s a truly special stop when you find a Burger King or Arby’s inside the gas station. After a few hours of driving, we arrived in Alvarado, Texas, south of Fort Worth. This is where the wait began again as technology took over. Half the team tossed around a football, while the others watched radar, satellite and weather models for hours as the storms built to the west. They’re looking for any hint as to which storm to chase. Fifteen years ago, chasers had no access to live weather data on the road. Mobile data services have now made it possible to see not only where a storm is on radar, but where the chaser is located in relation to that storm via GPS positioning on the radar map. Computer forecast models have also advanced significantly in the past five to ten years. Before, a model might tell you which state could have tornadoes in the next 24 hours. Today, models can tell you which county. Eventually, Timmer and the team saw what they’re looking for on their laptops, and we hit the road for Austin. Several hours later, the Texas Hill Country west of Austin was looking like another bust, with no tornadoes in sight. We decided to head towards San Antonio. Just as the sun went down, we arrived in town, and a severe storm southwest of the city was tagged with a tornado warning. This is what the team had been waiting for. The Dominator and Yukon head for the storm, losing the TV crew somewhere along the way. It was nighttime when we arrived at the location of the reported tornado. 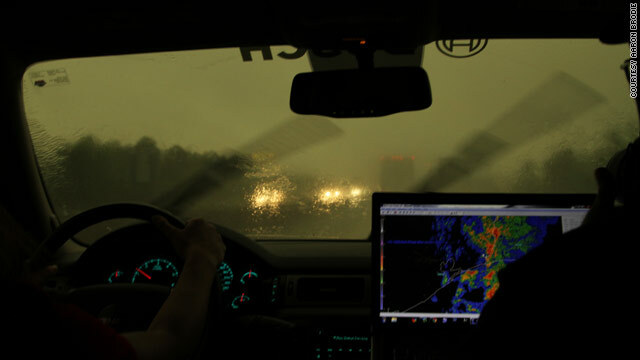 The Dominator pulled off the interstate and Timmer jumped out to start scanning the sky for signs of a tornado. Chasing tornadoes at night is very dangerous: a funnel can usually only be seen during lightning strikes, and by the flashes of power lines as they’re hit by the tornado. If you can’t see it, the tornado could run right over you. Timmer quickly spotted power line flashes, and he pointed to the sky. A bolt of lightning flashed, and there it was, a stovepipe tornado about two miles from us. It was slowly moving toward San Antonio and its million-plus residents. Timmer called 911 to report the tornado in hope of alerting people in the area. Fortunately, the tornado wasn’t on the ground long. The National Weather Service later determines the tornado to be 100 yards wide, on the ground for five miles with winds of 115 miles per hour. That puts it at the low end of the EF2 range on the Enhanced Fujita Scale, still easily strong enough to flip an 18-wheeler on Interstate 35. No fatalities were reported. After two long days of driving, the team had finally seen what they had been on a quest to witness, if only for a few short moments. Everyone headed for a nearby hotel, grabbed the first real meal of the day and prepared for another day of chasing. The storms over San Antonio would move into East Texas and western Louisiana on Tuesday. Anyway I used to pretend I was stormchaser when I was little, even now it still sounds exciting. Had I stayed back home in Texas maybe I'd of given it a shot, but now I'm on the other side of the world..